Standing at the foot of the enormous cross-legged Buddha it’s easy to feel overwhelmed. 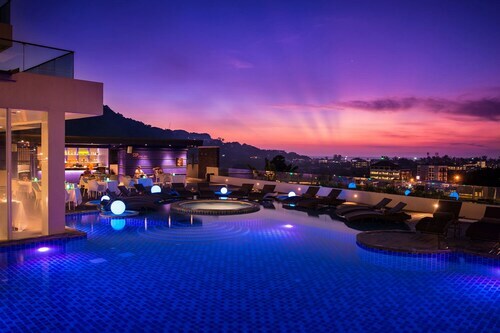 Both the size of the statue and the views of Phuket from its base are breathtaking. The Buddha is 150-feet (46-meters) high and 80-feet (24-meters) across. 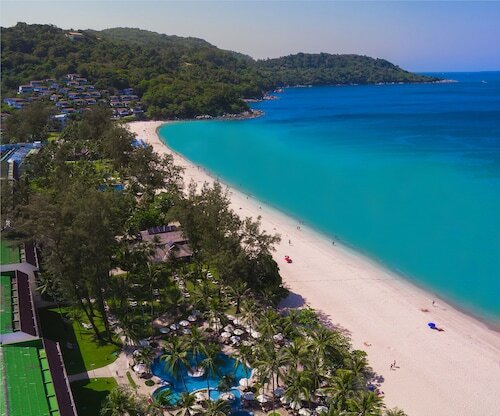 Vistas across the white sand beaches of Kata and Karon, Chalong Bay, and parts of Phuket Town are the best on the island. This is a place of worship and respite; praying monks, dharma music and Buddhist flags all add to the ambience. The ambitious project began as a symbol of hope after the devastating 2004 tsunami. It was funded entirely by donations. Layers of sparkling Burmese marble cover the Buddha’s body and are inscribed with messages of peace and love from those who donated to the cause. Read about the history of the project at a small museum on the way in, where you’ll also find souvenirs, donation boxes and,occasionally, a religious ceremony. A set of stairs from here leads to the base of the statue, where panoramic views await. There are actually two Buddhas on the site and it’s free to visit both. The second, gold-tone statue, though not as imposing at 39-feet (12-meters) high, is made from brass and dedicated to the Queen of Thailand; the Big Buddha is dedicated to the King. Although less crowded in the morning, consider visiting at the end of the day. Watching the sunset over the water from these towering heights is an unforgettable experience. Getting to the local landmark is easy and a stunning journey in itself. Take a tour or catch a taxi. It is about a half-hour drive from Phuket Town and there are plenty of signposts along the way. Energetic visitors will want to soak up the panorama as it slowly reveals itself on the 3.5-mile (5.6-kilometer) hike up the hill through lush rainforest. Re-energize at the top at the Nakkerd Sea View Restaurant, which specializes in seafood and spectacular views. Phuket Discovery Tour with Big Buddha & Floating Market is one of the interesting experiences available here. Take a look at our Phuket things to do page to learn about more activities while you're in the area. This family-friendly Karon hotel is located by the ocean, within 1 mi (2 km) of Dino Park Mini Golf, Kata Beach, and Kata Porpeang Market. Kata Noi Beach and Karon Beach are also within 2 mi (3 km). Situated in Karon, this hotel is within a 10-minute walk of Kata Beach and Kata Porpeang Market. Kata Noi Beach and Karon Beach are also within 1 mi (2 km). 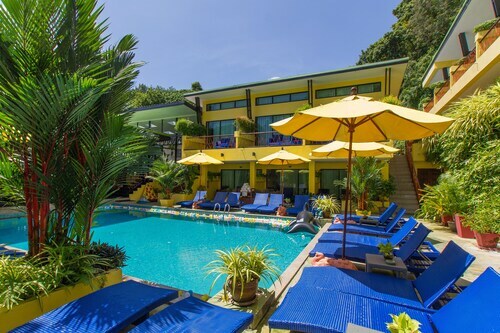 Situated in Karon, this hotel is within a 10-minute walk of Kata Beach and Kata Noi Beach. Karon Beach and Kata Porpeang Market are also within 2 mi (3 km). This family-friendly Karon hotel is located by the sea, within 1 mi (2 km) of Karon Beach and Kata Beach. Kata Noi Beach and Big Buddha are also within 6 mi (10 km). 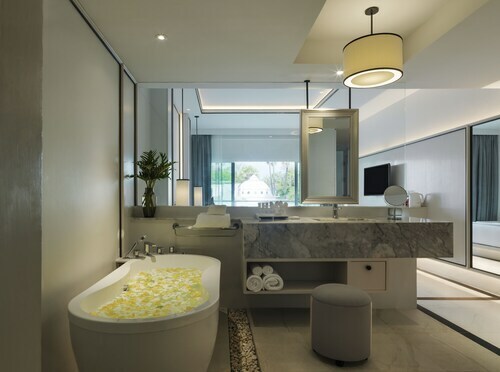 Situated near the beach, this spa resort is within 1 mi (2 km) of Kata Beach and Karon Beach. Karon View Point and Big Buddha are also within 6 mi (10 km). 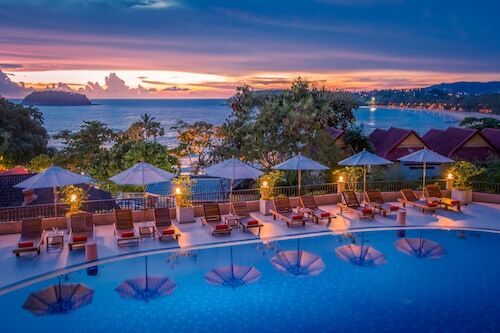 Nestled on the beach, this Karon hotel is within 1 mi (2 km) of Dino Park Mini Golf and Karon Beach. Kata Beach and Kata Porpeang Market are also within 2 mi (3 km). This family-friendly Karon hotel is located in the mountains, within 2 mi (3 km) of Kata Porpeang Market, Karon Beach, and Kata Beach. Kata Noi Beach and Big Buddha are also within 3 mi (5 km).